We used a fantastic blend of Egyptian, French, English, and Australian spells to cultivate this surprising and multi-layered, protective binding which safeguards against all forms of psychic attacks, evil eyes, curses, hexes, unbound spirits, unbound living entities from the Astral & Spiritual Realms, and creates a magnificent binding that keeps out all aggressive sources of negativity (natural & unnatural). An explosive binding which is made of inter-connected spells which starts by providing a foundation of protective enchantments which cleanse and keep your aura, 3 bodies, and space cleansed of all natural & unnatural attacks, energies, and voids. The secondary layer fortifies all protective & security measures you have in your keep be they spirits or spells, by empowering their effectiveness & ability to work harmoniously on a stronger level. The over-laying layer is a formed wall of energy which is an impenetrable wall that keeps everything about yourself private. No one will be able to read your mind, your thoughts, your energy, your spirits, your spells, your space, or anything else regarding your private journey unless you give them express permission. Howlite is a stone that relieves the energies of stress and helps you to find your inner calm. Howlite is a stone that soothes the mind and helps you to settle differences in your life. This stone absorbs negative energies and your dark thoughts while providing you focus and central power towards your future. Howlite dissolves negative energy and provides you the pathway to truth and divine power that you need in your life. Howlite helps guard against selfish actions and instill compassion. Howlite is a white gemstone with veins of grey through the stone. 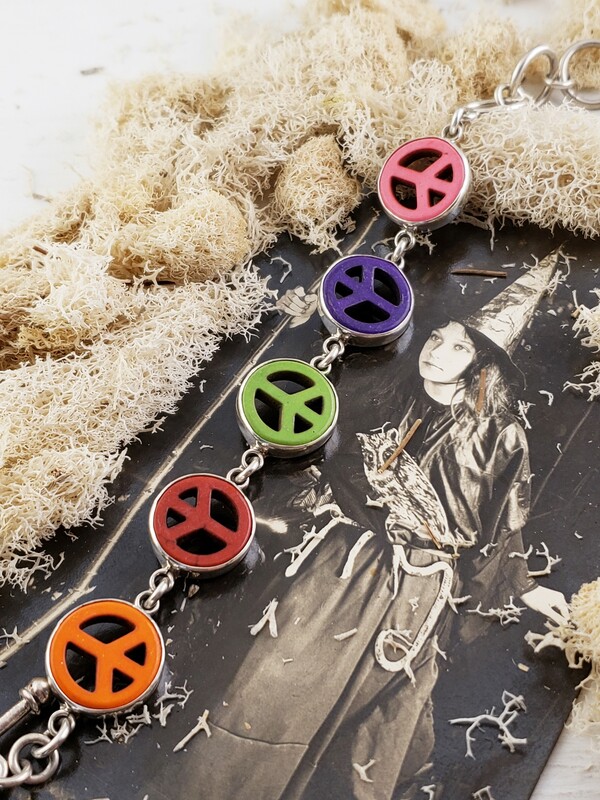 Vessel is sterling silver bracelet with various colored howlite peace signs.